The nerves started as soon as I got to North Carolina. Just driving into the state, stopping at gas stations, going where you go — I was on edge all day. I always wait until there’s a unisex restroom, because I’m afraid. I also don’t want to make people uncomfortable — my desire is to feel comfortable, but I don’t want to make other people feel uncomfortable either. If it’s a crowded public restroom, I know I don’t pass, and I know that if I walk into a women’s restroom, someone would possibly take offense. Maybe scream. Who knows? In North Carolina, with it being illegal, it was like, Okay, well, we’re going to wait until there’s a Starbucks, since Starbucks has single-unit bathrooms, and that’s where we usually stop. Which is ironic because I’m someone who wrote a song about throwing bricks through Starbucks’s windows. 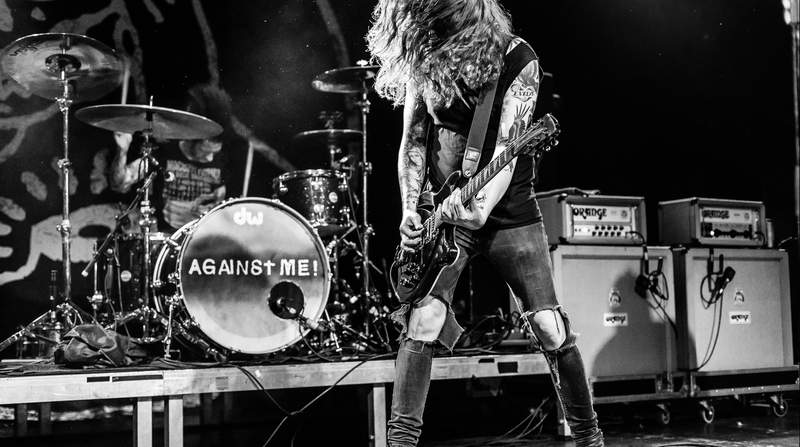 Laura Jane Grace has shared another song from her upcoming album.